Iterative app development always entails CoreData migration. Working with iterative development, we’ve learned a number of lessons about CoreData migration. Here are some helpful notes, a few warnings, and a number of useful techniques for our technology savvy readers. Of course, we won’t be able to completely break down migration step-by-step, as that would take several articles. And additionally, there’s no need to copy what’s already been said in the excellently written CoreData Versioning & Migration Guide. Our goal here is to share a bit of our firsthand experience. Since most development is done in an Agile manner, this approach is aimed at introducing a lot of changes from version to version. Sometimes these changes are planned and sometimes they’re not. Either way, alterations to the requirements or API changes are supposed to improve an app’s data model. Therefore, you need to perfectly adapt all those changes from version to version without losing user data ( sad, but true). No doubt, a growing complexity and new techniques used in the process of migration are highly dependent on the persistence framework. 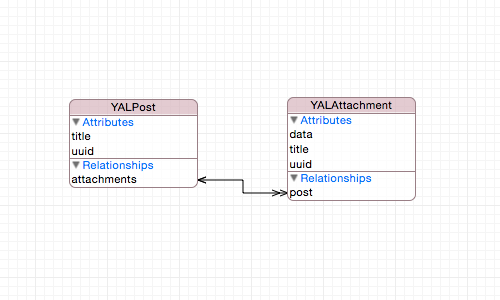 In this post we won’t talk about numerous interesting solutions like Realm, Couchbase or YapDatabase, but will focus on the well-known CoreData. As well all know, a model can change significantly during the development process. We’re talking about .xcdatamodel update, either a completely different one or improved, when it comes to CoreData. Since the source code is mostly up-to-date with the latest Model version, CoreData tries to map one representation onto another. Basically, migration is all about loading source representation, mapping it onto a representation, verifying results, and eventually saving the new representation. In other words, migration helps us keep our model compatible with changes in the source code. Now let’s focus specifically on lightweight migration, mapping models, and custom migration policies. > For a full set of features check out Lighweight Migration Page. Before changing anything always make sure you create a new model version: Editor -> Add Model Version... Otherwise, CoreData won’t be able to open the saved store and perform lightweight migration. Don't delete .xcdatamodels used for the published version. This follows from the first tip. Use Renaming ID for renamed Properties and Entities: View -> Utilities -> Show Data Model Inspector -> Edit Renaming ID. The value of Renaming ID in the destination model should be set to the name of the corresponding Property / Entity in the source model. 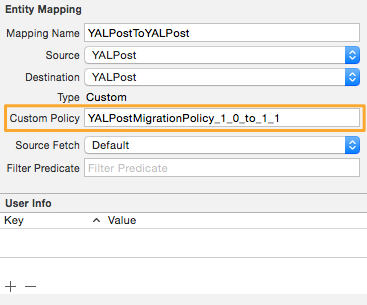 If the mapping model set by default doesn’t meet your requirements during manual migration, and some extra work needs to be done, you can use a custom migration policy. All you need to do is specify your policy class in the Mapping Model Inspector (Select Mapping Model and then go to View -> Utilities -> Show Mapping Model Inspector). Also, it’s important to note that during -[NSManagedObject awakeFromInsert] uuid is assigned to default value. First of all, we’re passing control to default the migration implementation by calling [super createDestinationInstancesForSourceInstance:entityMapping:manager:error:] The migrated instance is then retrieved. We also perform some manual manipulations in the post and assign generated default attachments to it. Nothing special here, right? However, all the migrated attachments don’t have uuid after the migration. How did that happen? 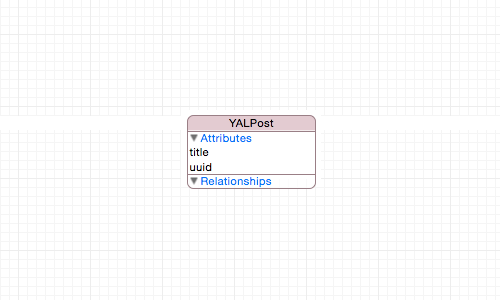 It’s clear that -[NSEntityDescription insertNewObjectForEntityForName:inManagedObjectContext:] should return an instance of the associated class (YALAttachment in our case). In fact, it returnsNManagedObject but notYALAttachment during migration. As a result, -[YALAttachment awakeFromInsert] implementation is not invoked. Therefore, you need to be aware of the instance’s class during migration. You might wonder why Apple did this. The answer may be fairly simple: there is no guarantee, that the model represents the actual class API. As you see, this approach forces us to move custom logic to separate objects. It makes testing code much easier. However, it may lead to breaking encapsulation in some cases. Keep your code clean by moving deprecated APIs to the custom migration policy. Since migration policy subclass represents a “snapshot” on the versions timeline, it’s a perfect place to put deprecated APIs. However, this would require you to rewrite deprecated functions in correspondence with KVC usage without any direct messaging. Do as little as possible during migration. Due to the change in the way the preview is stored, migration took about 12 seconds for 1k of records in one of the apps we developed! Time Profiler happened to be using a huge amount of UIImage rendering, which was part of the logic for the destination model. In order to speed it up, we did a little trick — moved the preview to the private destination path directly, instead of using public API. It saved us about 11 seconds! Why is this important? Users don’t want to wait. They are likely to reboot the app after 5-10 seconds of waiting. Obviously, breaking migration leads to even more complex issues, such as losing user-data. Therefore, do as few manipulations as possible during migration. Imagine your app has 4+ versions (1.0, 1.1, 1.2 and 2.0) which are all being used simultaneously. Some of your users haven’t updated the app yet. If we do migration manually, then the number of mapping models equals the sum of n — 1, where “n” is the number of released versions. Therefore, adding a new version becomes a real nightmare. On the other hand, progressive migration leads you to n-1 mapping models. As a result you have 6 versus 3 models for 4 released versions. We won’t cover the implementation of progressive migration in this article, but for now check out objc.io custom migration and SLCoreDataStack internals. In this example we’re using SLCoreDataStack, which encapsulates stack setup and progressive migration and handles merging policies between main and background contexts out of the box. Assign an empty view controller, that shows progress HUD as a root view controller of the key window. Create dispatch queue for actual initialization. Check whether migration is required or not. Launch actual migration. At this point there are a few extras you need to add: error handling and progress indication. Unfortunately, by default you are unable to grab migration progress. However, in our internal fork there is access to NSProgress instance, which reflects progress value. Continue application flow as usual. As a result you’re getting more control over the init flow. But it brings complexity to the initialization during State Restoration. That’s it for today. As you can see, it can be tricky to maintain a project when it comes to versioning, migration and backwards compatibility. However, CoreData really simplifies the process of the migration. We hope our experience with CoreData migration is helpful! Let us know if you have any questions! Remember those Facebook reactions? Well, we aren't Facebook but we love reactions too. They can give us valuable insights on how to improve what we're doing. Would you tell us how you feel about this article? Get stories to your email every Thursday!Want stories to your inbox? How Much Does It Cost to Build a Marketplace App Like Etsy? How to Achieve Loose Coupling? Full-stack mobile (iOS, Android) and web app design and development company. Liked the article? You will like our email too!